Packet Flow ASA | CCIE or Null! Packet flow through a Cisco ASA. As I was reading my Cisco Firewalls book I found this picture (very early on to) concerning how a Cisco ASA handles traffic passing through the device and the logic behind it. it’s a chart worth paying attention to in my opinion. 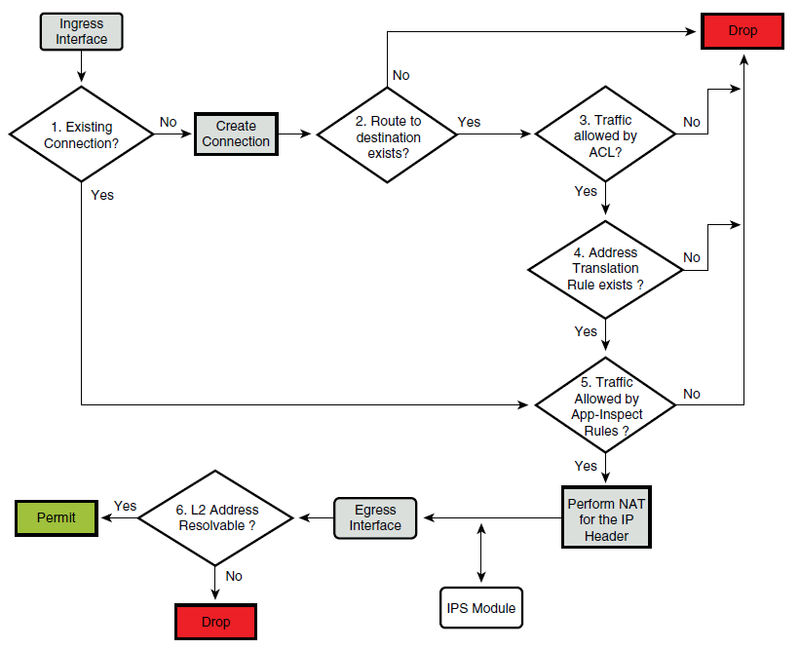 I mean we are going to be practical here, you are not going to run off and debug ip packet for every ASA issue you run into but knowing and understanding the flow chart below will surely give you an edge when troubleshooting ASA connectivity issues. ACL’s will be checked first. NAT rules will checked second. Inspect policies will applied next. Then after all that the packet enters IPS-AIM Module for inspection, after that it leaves through the egress interface.